The 4081 expansion board slots into the back panel of the 4081 and replaces the blank panel fitted to the standard unit. It basically provides 4 channels of analogue IN and 4 channels of analogue OUT to either FireWire or AES EBU. The internal connection to the 4081 main-board is done using two 26-way ribbon cables. The expansion board drives the front panel SYNC LED indication on the 4081 front panel. The expansion board has two modes of operation, determined by whether a FireWire connection is detected or not. The 4 analogue outputs from the 4081 Mic Pre or Insert are mapped to the two stereo AES outputs. The two stereo AES inputs are mapped to the 4 analogue outputs – these are simply an AES to analogue convertor. The 4 analogue outputs are also available on the 25 way D-type on the back of the main 4081 unit. If no sync input is detected (either Wordclock or AES), then the expansion board runs on internal sync and the sample rate is selected by the UP/DOWN buttons on the front panel. If a valid sync input is detected, then the sample rate is automatically calculated and indicated on the front panel. External AES EBU cable lengths are limited to 100M. 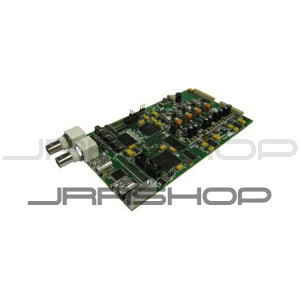 Multiple 4081 units can be cascaded onto one FireWire stream, or ‘starred’ back to the FireWire card. Up to 4 units per FireWire stream can be cascaded. 4 units gives 16 IN and 16 OUT on a single DAW connection if using FireWire, but the available bandwidth allows 16 IN and 16 OUT at 192kHz. The first unit in the chain becomes the master and provides the sync to the other 4081 units either via FireWire or Wordclock. Supports ASIO driver – the sample rate is set via the DAW software driver.